After Fr. Patrick Rodrigues, Spiritual Director of CAB, said the opening prayer, Alexander Anthony-President welcomed all. This was followed by input from various speakers. Fr. 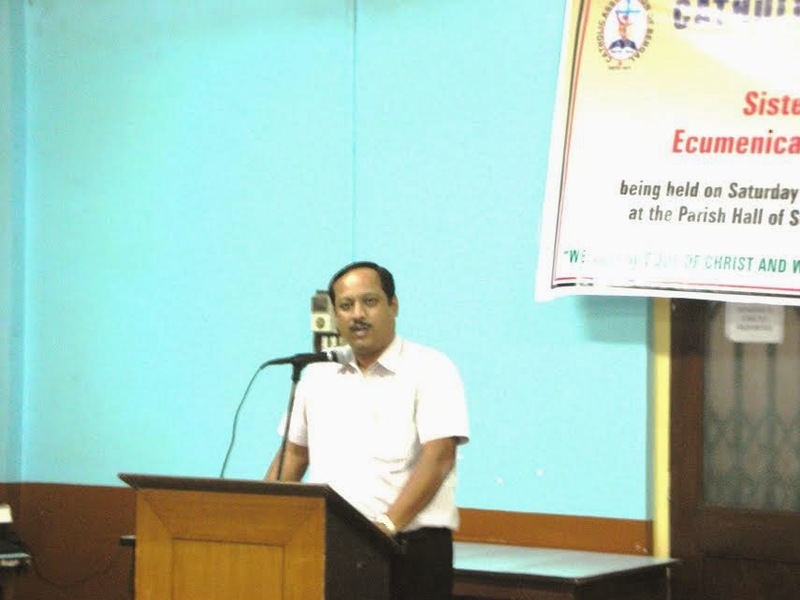 Francis Pinto spoke of Martin Luther's desire for vernacular Mass. Luther was the first to write a Catechism of the Church. Until 50 years ago, when Vatican-II brought fresh air into the Catholic Church, Catholics were not allowed to read the Bible. Instead they were handed a 15-decade Rosary to learn prayers by heart! Pastor V.C. 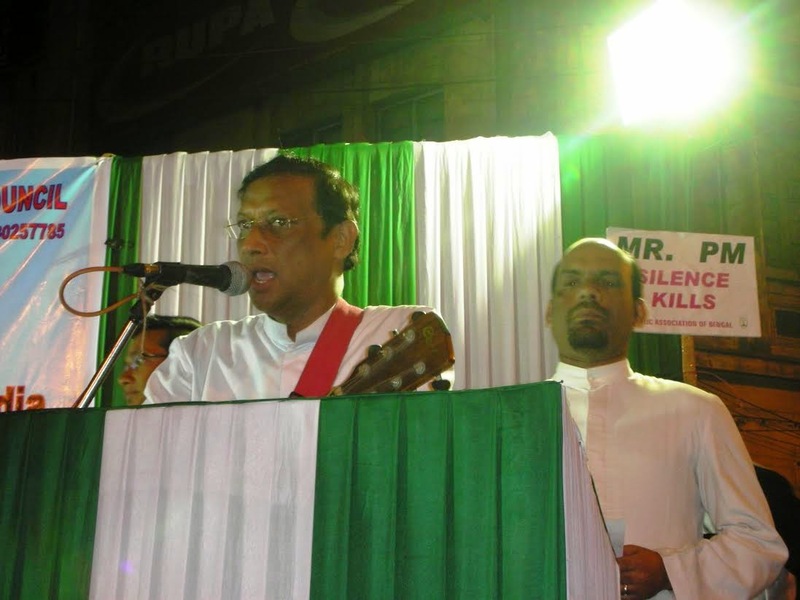 George Kutty (Assembly of God Church) quoted Corinthians Chapter12 : “For as the body is one, and had many members, and all the members of that one body, being many, are one body: so also is Christ.” He said in the Church, too, there are different denominations but all worshiping one Christ. Diversity is not division but an evidence of the wisdom of God. like Christ’s disciples who were of one accord, he said. leaders was worse than persecution of Christians. He prayed for Chief Minister, Prime Minister and other leaders. AICU National President, Eugene Gonsalvas, spoke of Unity Octave initiatives. He stressed Christians should set examples by service and behaviour and priests should keep away from power and money. 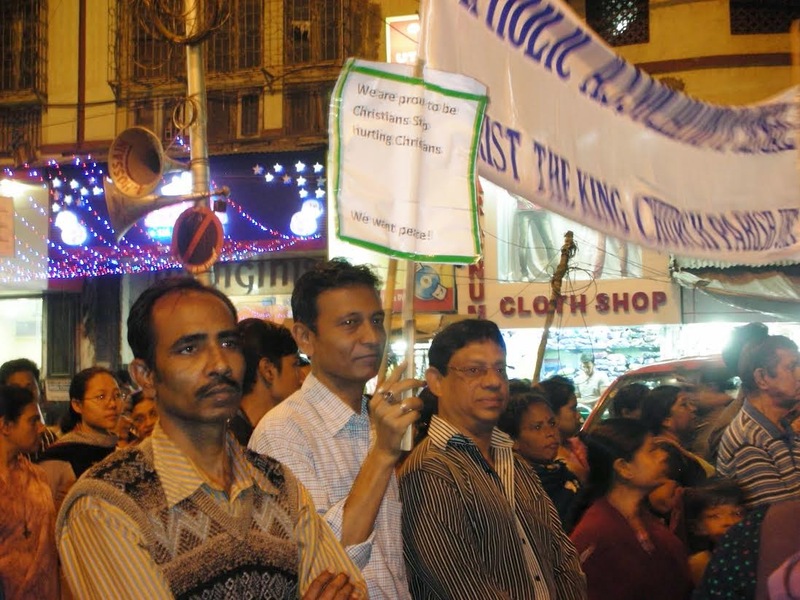 Lay evangelist Gaurav Singha Ray testified that, after long search, he had found Jesus and would live as Salt of the Earth. The Archdiocesan Social Communications Commission (ASCC), represented by Mr Isaac Harold Gomes, visited Auxilium Parish, Sunday, February 15, to initiate the formation of a Parish Media Team. The Commission plans to create such teams in every parish of the archdiocese, and start parish newspapers in all parishes which do not yet have a newspaper. ASCC facilitators will handhold the PMTs until they are able to function well independently. Today's meeting will be followed up with a workshop on parish journalism for the team, shortly leading to starting of a newspaper in the parish. Three other city parishes will be visited this month as part of the programme, for which facilitators were trained last November. Kudos to the new team, and Parish Priest, Fr. Robin Gomes SDB, who is also a facilitator for the project. 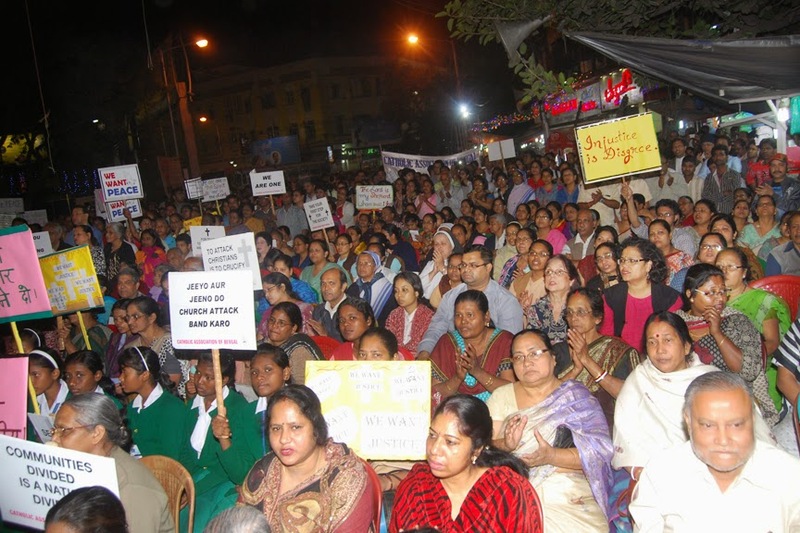 On a day when Delhi delivered an AAPsolute mandate for secularism, February 10, 2015; the Archdiocese of Calcutta, along with West Bengal Minority Development Council, organised a protest at Park Circus 7-Point Crossing, starting 6 p.m.
“Attacks on churches and other holy places of minorities are attacks on Indian secularism and the Constitution...Christians have always worked for India’s development - why are our places of worship and properties being attacked and destroyed? "যে কোন ধর্মস্থানের উপর আক্রমণ এবং তার পবিত্র জিনিষ ধ্বংস করা সভ্য সমাজে কোনমতেই মেনে নেওয়া যায় না৷"
Believers in religious freedom and concerned citizens of all faiths joined the large numbers of laity, religious and clergy, over 2000 strong, at the landmark roundabout terminating Park Street, to express their concern over the recent anti-Christian incidents and vandalism at Delhi and elsewhere, and to demand justice. 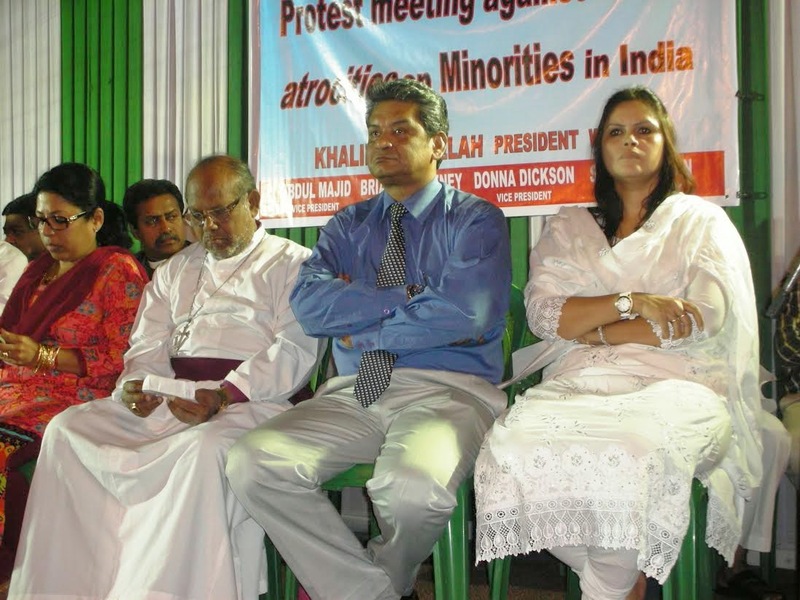 Besides the leaders of various Catholic action bodies, Bishop Raju of the CNI church was present, and others like social activist Lovina Khan. Speakers including Alexander Anthony, president of CAB, condemned the rash of heinous crimes expressing concern at the perceived silence of the Prime Minister, even as the incidents grow. They alleged the threat toward the peaceful Christian community - which has always contributed significantly to the nation - was being ignored. 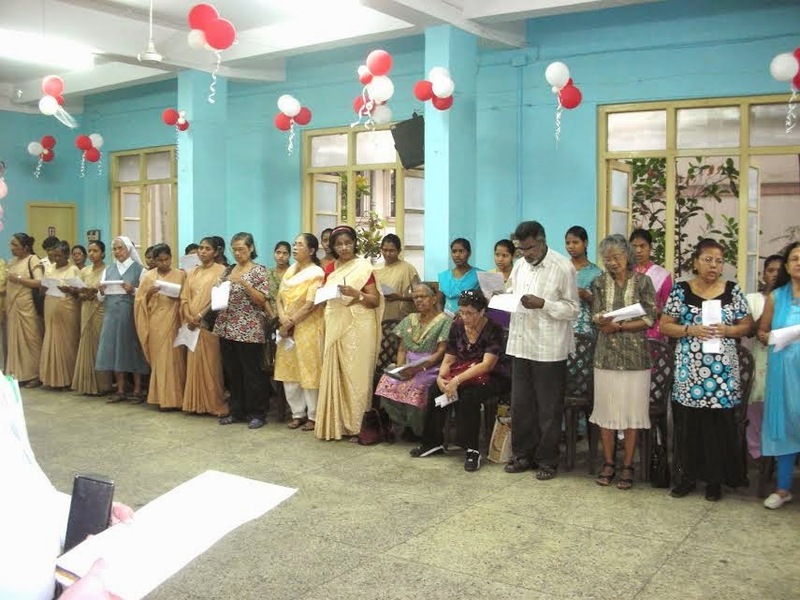 Eugene Gonsalves, President All India Catholic Union (AICU) said that though Christians were about 2.5% of the Indian population, their share in the service sector was 24%. He remarked that, if all minorities were united, they would become a combined force of 30% - enough to counter any anti-minority agendas. Fr. Dominic read out a copy of the Memorandum to be submitted to the Governor and sent to the Prime Minister. 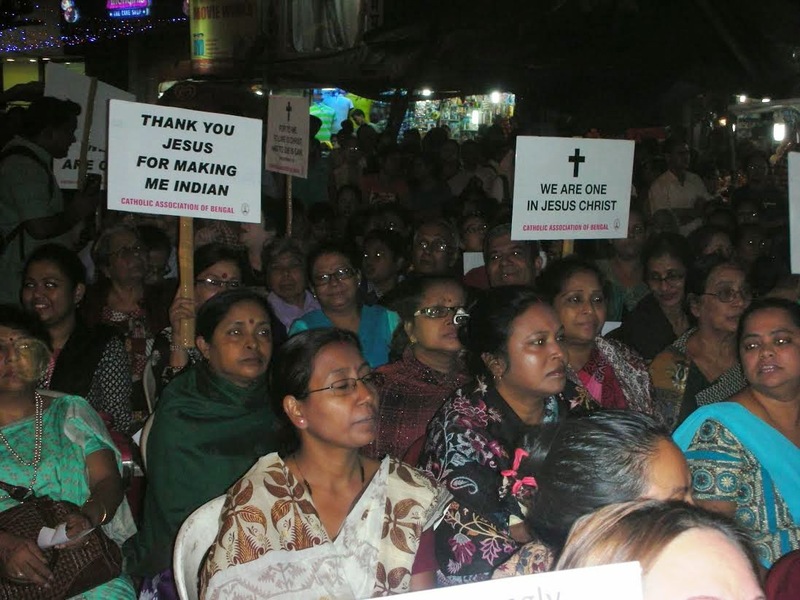 "The Church in Kolkata is deeply anguished by the frequent attacks on our churches in the national capital and other areas of the country. The desecration of our Holy churches is totally unacceptable. We strongly condemn such deplorable acts and demand exemplary action by the government against the perpetrators of such heinous crimes. The continued silence of the authorities is deafening and equally deplorable." 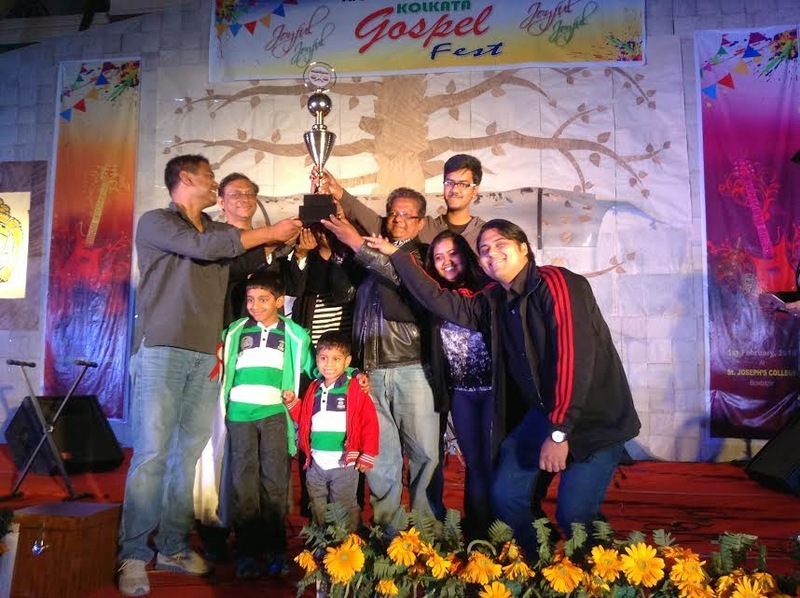 JOYFUL JOYFUL - IT'S KOLKATA'S OWN GOSPEL MUSIC FESTIVAL! 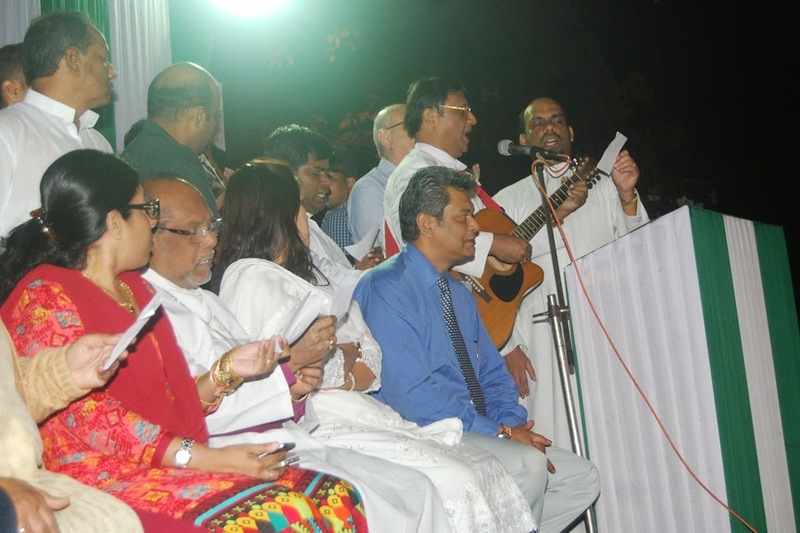 The mild chill of the winter evening on the compound of St. Joseph's College, Bowbazar, played host to the very first Kolkata Gospel Music Festival, February 1, 2015. Themed Joyful, Joyful! the response to this novel confluence of music, art and celebration was quite encouraging, with seven churches putting up groups - each with a Biblical stage name. Conceived by Vicar General, Father Dominic Gomes, the festival seeks to encourage the youth to channel their musical talents towards praise and worship, and bring fresh life and energy into our choirs. Well-known Assembly of God Church soloist, Savita Kapper, set the tone of the evening, before the competitive Gospel Band sessions began. Infant Jesus Church (Behala) was The Revelations, while St. John's Church (Sealdah) went on Exodus. 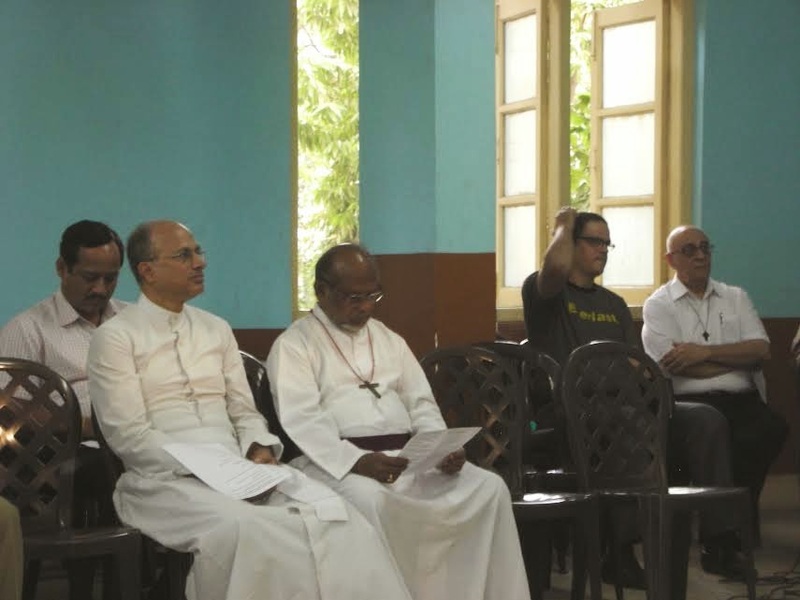 It was good to see even a parish as far away as Santragachi (St. Joseph the Worker Church) keeping Faith. Our Lady of Vailankanni Church (Picnic Garden) fielded The Petitioners, while Christ the King (Park Circus) flew on Wings of Eternity. St. Ignatius Church (Kidderpore) was The Desert Voice. 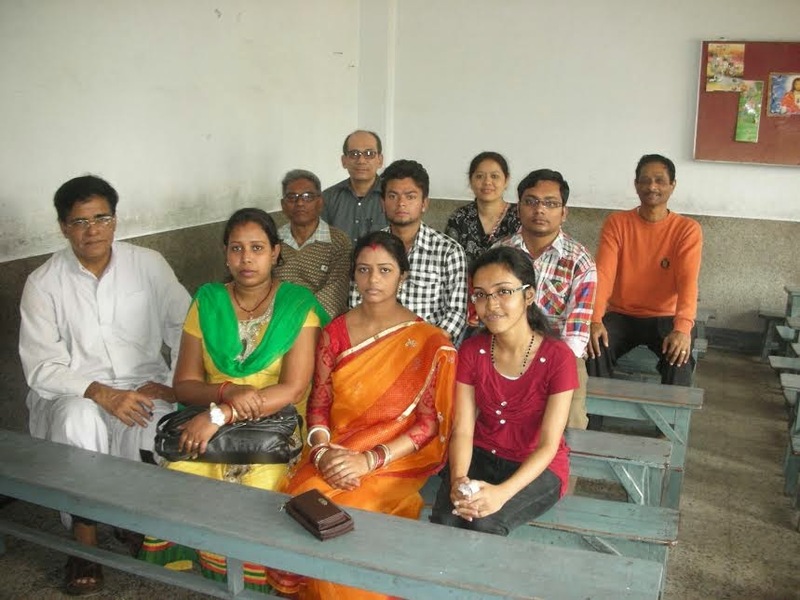 Auxilium parish also took part in the competition. Judged by a trio of Kolkata's great professional musicians - Sonia Saigal, Avik Ganguly and Subhomoy Mitra - Our Lady of Vailankani emerged Festival Champions. Runners up were St. Ignatius, followed by Christ the King, in third place. While the scores were being compiled, our international star Sonia Saigal had entertained the crowd with Gospel rock, but there was another treat for those who waited till the end. LoveInChrist, the eclectic guest band featuring Shon Anderson (vocals), Avik Ganguly (keyboard), Dominic Kazo (bass), Stafford (Lead guitar) and Wilfred Pereria (Drums) was thoroughly entertaining. We await Chapter II of the Kolkata Gospel Music Festival! A total of 64 players who qualified from the Women’s World Championships 2012-2013, FIDE rating lists, World Junior Championships, Continental Zones and FIDE President’s nominees will compete in the knockout tournament, with six rounds. The first five rounds of matches will consist of two games per round, with the winners progressing to the next round. The 6th round (final round) will be played over four games and the winner will be declared Women’s World Champion. The minimum estimated cost is three to four lakh in Indian Rupees (airfare from India and back, hotel expenses and training under experienced coaches). Mary has to bear all the costs without any support from the Indian government. 2013” Bulgaria 10th – 18th June 2013. · Bronze – World Team Chess Championship 2013, Astana Kazakhstan. · Bronze – World Youth Chess Championship under 18 Girls, Georgia October 2006. 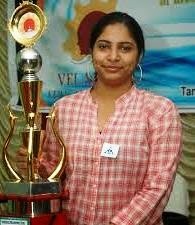 2013 and in Commonwealth Chess Championship (Women), Chennai November 2012.
and 2013 held at Chennai, Jalgaon and Kolkata respectively. According to Mary’s father, for 19 years, through sheer drive and consistence practice, Mary has earned her chance at the world title. He strongly believes that if Mary is supported with finance and prayers by our Christian community, she will achieve her goals and make our country, state and community proud. Considering the prestige associated with the Championship, the pride of Kolkata and the golden chances of Mary being nominated for Arjuna Award 2015, it is high time our Catholic Community, our MPs and MLAs rose to the occasion to hail this rare talent. After all she is our National Asset.